How do you become a Turf Moor hero? Do you have to play a set number of games before being considered? Do you need a list of achievements as long as your arm? The answer quite simply is that there are no rules. The Burnley crowd take to some players more than others. 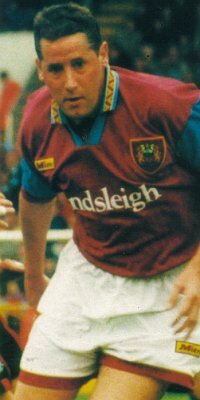 Enter Ted McMinn, also known as 'Tin Man', on loan from Birmingham in March 1994, signed by Jimmy Mullen as the Clarets went into the final stage of the season searching for a place in the end of season play offs. McMinn had been a big favourite with the crowd at Rangers in his Scottish homeland after Jock Wallace paid Queen of the South £50,000 to take him to Ibrox. They loved him there and were disappointed when he decided to move to Spain and sign for Sevilla in 1987. However, a year later he joined Derby County, the first of his three English clubs. The Baseball Ground fans adored him just as the Rangers fans had and it was whilst at Derby that we got our first glimpse of him at the Turf when he tore Ian Measham apart in an FA Cup tie, the famous tie that led to the amazing crowd scenes in the replay at Derby. Burnley central defender Steve Davis labelled him a cheat, but we simply had no answer to him and I'm certain Mullen must have decided that day that he would like him in his Burnley team. An unsuccessful move to Birmingham followed in 1993 before Mullen made his move. It was on loan initially for one month but he was then signed on a permanent basis for £70,000. His debut came at Fulham, but the game was lost, before his home debut a week later. Somewhat appropriately it was against Stockport and he scored our goal in a 1-1 draw. He was to meet up with Stockport again just a few weeks later. He established himself in the side and I can still remembering him tormenting Plymouth defenders during the final stages of our play off semi-final, but the best was still to come. He didn't score at Wembley, I wouldn't say he had the best of games, but he certainly wound up that unprofessional outfit. With the Clarets a goal down he was quick to point out to referee David Ellery that Michael Wallace had spat in his face. Ellery agreed and the Stockport player was the first of two to be sent off. David Eyres and Gary Parkinson scored the goals that day, John Pender lifted the winners' trophy, but ask Burnley fans to recall one player from the game and many will give you the name of Ted McMinn. Newly promoted, Ted was speaking to fans before the first home game of the following season. He reckoned we'd be relegated because of the way we were going to play. He was proved right and spent the season in and out of the side. In the following season he was again unable to establish himself and when he was substituted just a couple of days before Christmas against Bristol City his Burnley career was over. Just a few months later he controversially disappeared with new manager Adrian Heath claiming he was no longer part of the plans. He turned up in Australia but came back to England to work alongside former Derby team mate Mark Wright whilst he was manager at Southport, Oxford and Chester. After some controversy at these clubs he decided to end his role as a coach. Tin Man returned to Derby to work for local radio but an infection in his right leg led to him having to have part of his leg amputated. He continued to work for the radio station but walked out on them after the first game of the 2007/08 season claiming to be undervalued. He moved into the taxi and courier business in the Derby area. His Burnley career lasted less than two years, but that was more than long enough for him to be in the nominations for the club's cult hero. He was a wonderful talent, a fantastic crosser of a ball. However, my lasting memory of him is that hurt expression on his face as he told Mr Ellery what had happened at Wembley. Thanks Tin Man for helping make it a great day out.